With all eyes riveted on Abou Dhabi and Verona, the hope was that the Louvre-Atlanta agreement had been put behind us. The most debatable exhibition, that is the one which leased some of the museum’s masterpieces for export without a true scholarly purpose , was over. Following the more traditional and modest presentations albeit with a real content (see news item of 1/4/08), the third year was to be devoted to “The Louvre today and tomorrow”, described on the Louvre-Atlanta website as "highlighting the development of the present-day Louvre and its new relations with society and the world" (?). And yet, in the stealthiest manner possible, as usual, this third stage has been completely modified as it is now called “The Louvre and the masterpiece” which will present for 11 months  no less than The Lady of Auxerre , one of Leonardo’s Draperies, The Cheater with the Ace of Diamonds by Georges de La Tour, an oft-victimized painting which is regularly shipped off to the four corners of the globe, the remarkable Christ Bearing the Cross by Lorenzo Lotto and, particularly, Vermeer’s Astronomer  (ill.1). More worrisome still : the show will then travel to Minneapolis for an additional three months, much as “Kings as Collectors” had extended its tour to Denver. In another serious turn of affairs : an exhibition of the same type, devoted to 17th century art (70 paintings  !) will be sent to Kyoto and Tokyo, with the title “The Louvre Museum Exhibition : 17th Century European Masterpieces”. And what will there be in this show which will last a total of seven months (in two museums), next to one of Rembrandt’s Self-Portraits, one of the two Moses Saved from the Waters by Poussin and Ixion, King of the Lapithae, Deceived by Juno whom he Wished to Seduce by Rubens ? 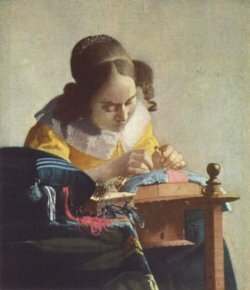 No less than the second Vermeer at the Louvre, The Lace Maker (ill. 2) which will travel to Japan from February to September 2009. So now we know : between February and September 2009, neither of the Vermeers will be at the Louvre. The artist’s two paintings, the only ones held in France out of a total of about thirty known works, will be leased to the highest bidder. Once again, the museum’s directors are treating the collections as a negotiable commodity, a supply to be used at will and without any discernment. The Louvre seems to have opted for becoming a second-rate museum where its masterpieces come and go regularly thus abandoning its vocation to present a complete panorama of the history of painting. The program in Verona had already alerted us to the fact that a significant number of its major works could leave at the same time. This only goes to confirm a disastrous policy which will only get worse with Lens and Abou Dhabi. After barely returning from Atlanta, Murillo’s Young Beggar is once again leaving for Bilbao where it will be seen in a retrospective on The Young Murillo. The Portrait of Sigismundo Malatesta by Piero della Francesca is in transit somewhere between Madrid and London for an exhibition on Renaissance Portraits (we will talk about it here soon), along with The Portrait of an Old Man and a Young Boy by Ghirlandaio . The Louvre is becoming a temporary exhibition space for its own collection. On 19 and 20 September, Henri Loyrette will be in Verona to discuss terms for an “indemnity” to the city after cancelling the exhibition Portraits and Figures (see news item of 24/5/08). 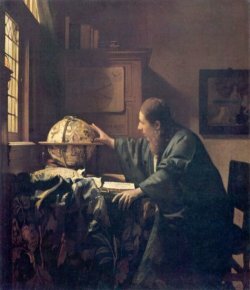 The Italian city will be happy to hear that the two Vermeer paintings will once again be available for lease starting in 2010. A look at the catalogues published at the time is proof of the lack of substance. From 11 October 2008 to 6 September 2009. This archaic Greek work does not belong to the Louvre but to the Musée d’Auxerre which has deposited it here to fill a gap in the collection. The information is provided by an AP wire which appeared on the Daily Yomiuri site online. The “patron” is Nippon Television Network Corporation. And yet, the museum prefers to leave the wall blank and will not display thePortrait of a Young Man attributed to the artist.